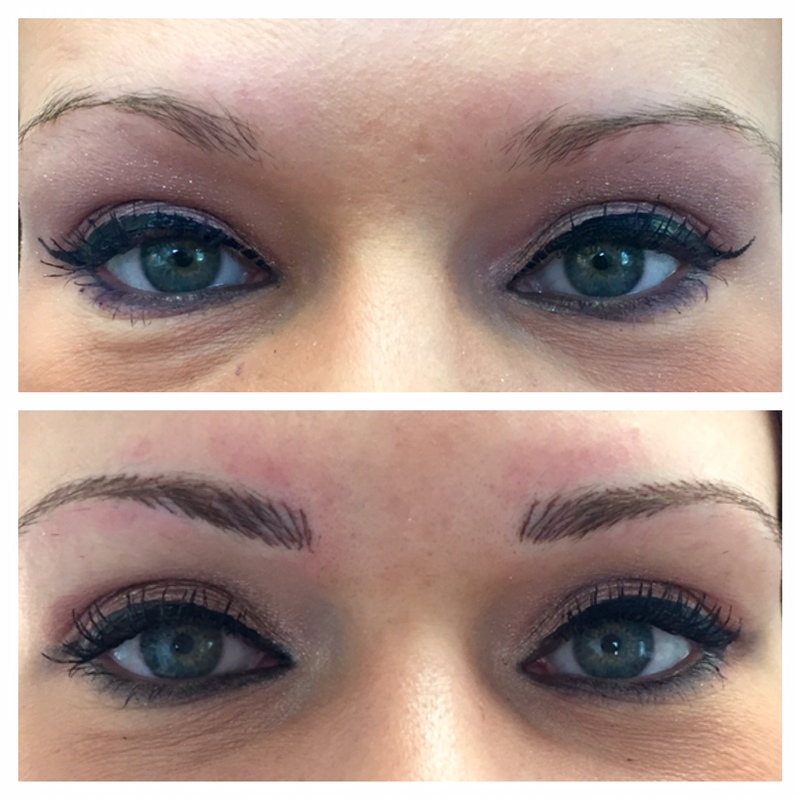 Client had no existing hair but a wash of color from eyebrows that had been applied a few years prior. We added definition and dimension by using the hair stroke method over the shaded area. Will soften to a nice ash blonde color in a few weeks. Hair Stroke brows are not just for those with hair loss. They can greatly benefit the look for those who still have hair but always needs to pencil in shape. I like to use this method to create a natural looking brow from the moment you jump out of bed. These brows are untouched photos from immediately following procedure. They will soften over the next weeks and blend seamlessly with the existing hair. Today I had my eyebrows permanently “created” by Marybeth. I am so very happy with the results and with Marybeth and the lovely, relaxing space she has created to work in. I do not like to have anything done to me by someone who is rushing through a procedure, who is all business and who suggests other work I could have done by them or another in the same group. I know what I want; if I am pleased with the results of that and want something else done I will ask about that. They can give me a brochure but let me feel like a person; not something you are trying to sell to. You will NOT find that happening with Marybeth. She is one of the nicest people I have met; you feel comfortable with her right from the start. She asks about your comfort level during the procedure; has you look at what she is doing part of the way through. She is quite professional but she is also very concerned with how you are feeling. It took time everyday to use eyebrow pencil or eyebrow powder and I seemed to never get both eyebrows shaped the same way. Now that is not a problem. Marybeth’s prices are within reason. If you decide to have a consult you will be glad you did. Sometimes it hard to describe what you are looking for when thinking about eyebrow enhancement. For or those with hair loss, thyroid, chemotherapy, trichotillomania or over-tweezing you may consider Hair Stroke to simulate individual hairs. Sometimes, you have some hair but are still always reaching for the pencil for shaping and shading. In this is case a Powder Fill brow is perfect for you. Here is an example of before, during and after. This will be soft and look subtle after healing, while still enhancing the shape of the face. Call us for a free consultation. 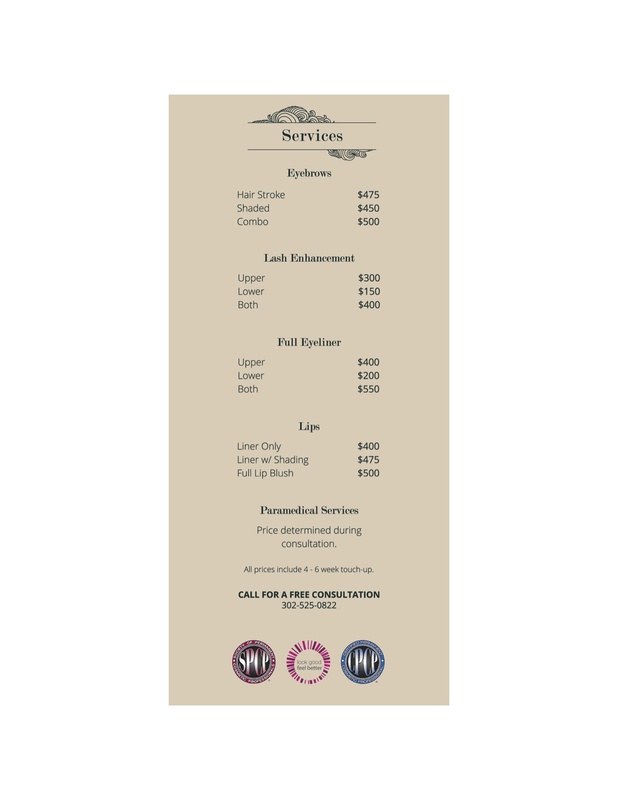 Below please find our menu of services and pricing. 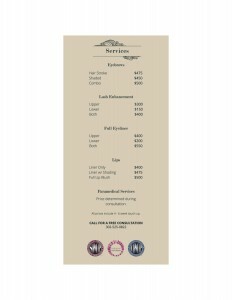 Remember, consultations are free and prices include your 4-6 week touch-up. When designing these brows I opted to follow the upper line of her brow allowing for an added “lift” to the eyes. I used both both hair stroke and shade techniques. We really restored a youthful look! The eyeliner was also done at ESPM. Please forgive me as the “before” picture was taken outside with the sun in my clients eyes. I forgot to take one inside the treatment room before the procedure. I am happy to share our new Eastern Shore Permanent Makeup logo with everyone. Click the link below. You will soon see it incorporated into our website and marketing materials. I would love to thank Sara Chandlee a wonderful, talented local graphic designer for her hard work and artistry. 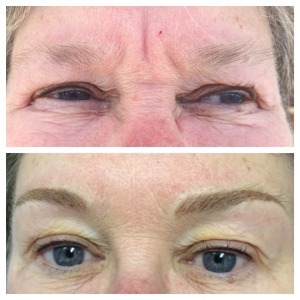 Here at ESPM we offer both hair stroke eyebrows and a soft powder-fill eyebrow technique. 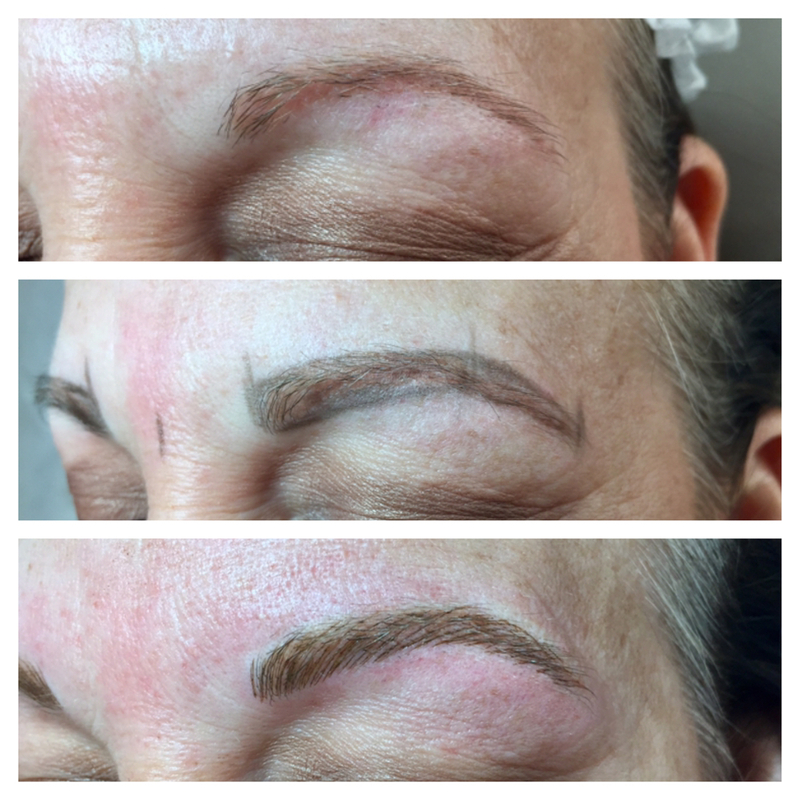 Having your eyebrows subtly enhanced can help with hair loss issues due to aging, over-tweezing, alopecia and trichotillomania. Diminishing eyesight can also be a factor when determining of this service is right for you. Please call to schedule your free consultation today. Today I had my eyebrows permanently “created” by Mary Beth. 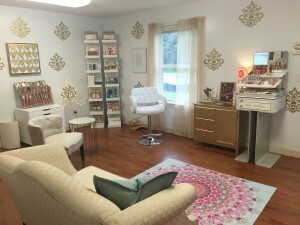 I am so very happy with the results and with Mary Beth and the lovely, relaxing space she has created to work in. Mary Beth’s prices are within reason. If you decide to have a consult you will be glad you did. Can I say Wow! What a difference it makes having eyebrows. I knew about eyebrow tattooing for years. Having two TATs on my legs I don’t know why I was afraid to have my brows done. After meeting with a childhood friend and she told me she had her brows tattooed, I thought why not. So began my search to find someone to do them. 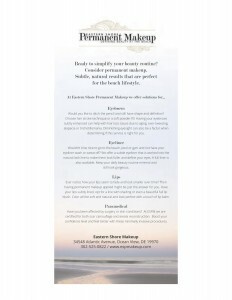 I did a Google search and quite by accident stumbled upon Eastern Shore Permanent Make up. Knowing that I would be in the beach area on weekends, I decided to schedule a consultation. Boy, I am so glad that I did. My consult was professional and personal. Mary Beth explained in detail what happens during the process and quieted any fears of pain. 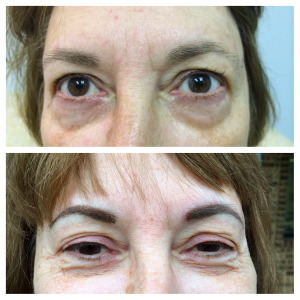 She helped me to select the perfect color and took many before pictures to map how she was going to give me what I call a perfect brow. You see I struggled many mornings trying to match both brows only to learn that brows are sisters not twins. After seeing myself with what a brow should vs what mine would look like, I scheduled an appoint to have them done. I was greeted warmly both times that I entered her salon. Marybeth studied the before pictures and explained again what she was going to do. A topical anesthetic was applied while she set up her room then again during the process, so any pain is minimal. I felt totally relaxed in the reclining chair and comforted underneath a warm fuzzy blanket. With mirror in hand Mary Beth performed her magic. Reassuring me along the way that I was doing well and asking how I felt. I was overly excited with my new look. I am a blonde and must say my brow color came out darker than the shade of eyebrow pencil I was using. After seeing the results, I will admit I want the dark color! After meeting Mary Beth I found her to be a very charming and competent person in her field. I was very happy with the results! She made my appointment with her a very enjoyable experience. I would certainly high recommend her highly. As I approach my 70th birthday, I decided to get something for myself that would make me both feel good, and look good. Realizing that I have never learned to get my eyeliner looking good all day long, especially in warm weather, I decided to have permanent eyeliner done. 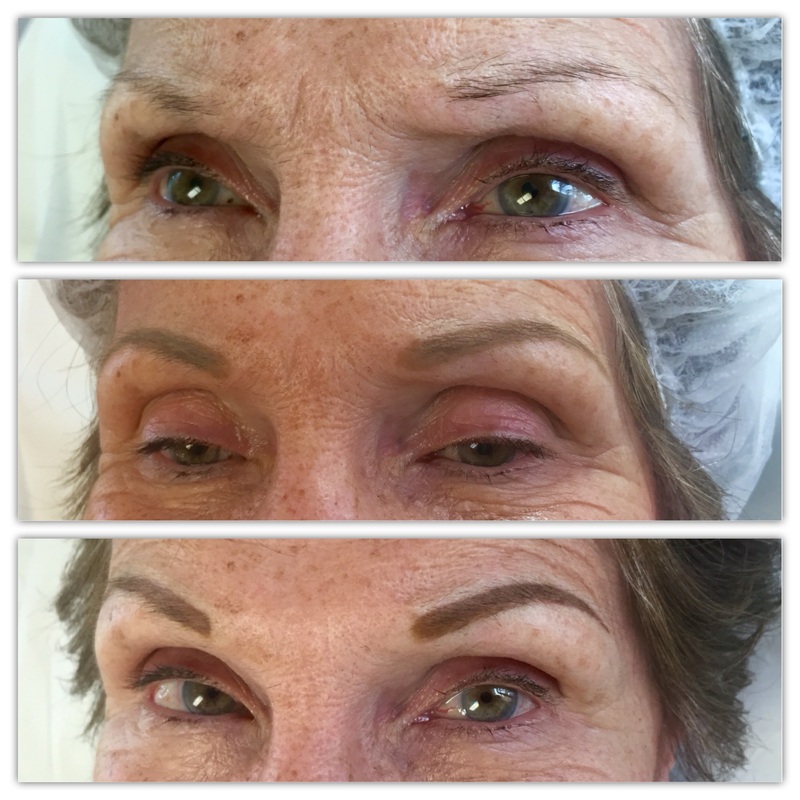 I highly recommend Mary Beth to anyone considering any permanent makeup procedure. Mary Beth is the most professional, compassionate lady you will ever have the privilege to work with. I am so pleased with my wonderful new eyebrows! What a difference. I have thyroid issues and been frustrated for years with thinning, weak brows. Mary Beth’s sterile, relaxing environment gave me the confidence I needed to have the procedure done. Her knowledge and artistic sense of tattooing gave me very very natural looking eyebrows. I couldn’t be happier with my new look! She is truly a gem down on the eastern shore. I was initially apprehensive because I wanted to make sure the results were subtle and natural looking. Once I met Mary Beth and saw her natural look, my fears disappeared. As a former science teacher, I appreciated her thorough explanation of the process, and her meticulous adherence to hygienic standards. My family and friends tell me that I look years younger with my “new” brows. 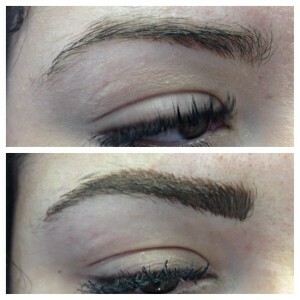 I have to honestly say that my brows far exceeded my expectations!I do indeed have a fresher, younger, uplifted look. Mary Beth is a true professional who asks for and uses your input to achieve your desired look. Mary Beth you are the best. Every step of the way you were there for me. You were very professional but yet friendly and very caring. Your desire to have everything perfect was evident and much appreciated. It was a great experience and I would recommend you to anyone. It’s been a week and a day since the second part of my permanent eyebrow and eyeliner make-up procedures. I have healed very quickly and I have to say that I love the natural look of both brows and eyeliner! Mary Beth’s expertise is amazing! Also impressive is the environment where she practices her considerable skills. The room was immaculate and all the instruments used were sterile. I had absolute peace of mind at all times.As promised, both procedures were relatively painless. Just a little discomfort now and then, but very tolerable. I enjoyed the interaction afforded me during the preparation process as we chose the shape and color of the brows and liner. I also appreciated the consideration and respect given during the procedures. Mary Beth periodically asked how I was feeling and had me check my appearance in a mirror for approval and input on any changes desired. I felt that it was a uniquely collaborative effort. I have no hesitation in recommending the services of Eastern Shore Permanent Makeup and Mary Beth to anyone who would like to experience the advantage of having permanent make-up. Not only does it save time on a daily basis, but it gives added confidence in knowing that you look your best! I went to Mary Beth French for several facials over the last few years and found a big difference in my complexion. My husband says I look younger, fresher and I have a glow. We are both delighted with the results! I have always been curious about the prospects of permanent eyeliner and eyebrows but the thought of tattooing really scared me. 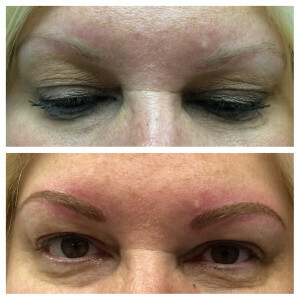 Needless to say, when Mary Beth told me that she was going to open Eastern Shore Permanent Makeup it gave me the courage and confidence to move forward. 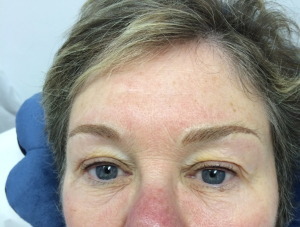 My eyebrows look much fuller, yet natural and the procedure was painless. Mary Beth is very professional, knowledgeable and I am impressed with the caring and follow up I received and the cleanliness of her salon. She truly cares about her clients!! “Since living in Delaware, I have found myself affected by seasonal allergies. Every spring and fall I am one of millions of Americans that suffer with watery eyes, sneezing, and yes, lets not forget the constant eye-itching. At these times of the year, I can’t wear eye make-up and using contact lenses is also impossible. Needless to say, I was feeling frustrated not looking how I would like to look. A couple of years ago, I noticed that a friend of mine had permanent eyeliner and it looked great! I then thought that this could be a good solution to my problem, but was not feeling all that comfortable and secure about doing a procedure like that. After all, it is my face and most importantly my eyes! But a few months ago, my best friend had permanent lip makeup done by Mary Beth. I was taken by how natural and beautiful her lips looked. I then found out that she also did permanent eyeliner and so I decided to take a leap of faith. I have to admit, that this has been the best decision I have made.